Weddings are about personalities, relationships, raw emotion and life changes. It is our goal to use photography to tell the story of your wedding day, not dictate it for you. We offer professional photography in a high end, fine art, photojournalistic and documentary style. Documentary wedding photography is its own art form. It is a blend of photojournalism, fine art, and portrait photography. When looking for a photojournalistic photographer, be sure to look through their portfolio for candids, decisive moments and emotions. Journalistic photographers tell the complete story. Effective journalistic wedding photographers are mostly "hands off" during the events of the day, so the day can flow naturally. They also encourage the couple to think about what "formals" are really important so as not to keep them from the guests. By emphasizing candid photographs we will capture emotional filled images of your wedding day, the private, unseen moments during a wedding day which are usually missing from traditional wedding coverage. Your father's look just before he escorts you down the aisle. Sisters laughing and sharing their happiness. The boutonnieres in their boxes, the dresses on hangers, the mostly eaten cake, exciting, touching, romantic, fun and loving side events and other unnoticed details. 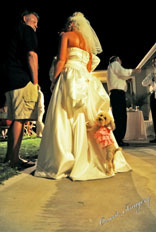 We focus on the "real life" of your wedding day capturing timeless moments. Every wedding is different. Every couple and family has their own story to tell. The right wedding photographer with the right approach knows exactly when and how to grab that moment in time so you can actually relive it forever. Years from now you'll be able to look at your photos and remember how you felt at the moment of each photograph. Capturing a moment in time is very important to us. We personally photograph all the weddings we contract so you will never have a surprise by someone you don't know showing up and you will always have the advantage of two photographers. Our philosophy is to leave the couple to enjoy their wedding day and document it accordingly. We have more than 20 years of experience in the art of photography along with a strong art background.